On September 18, we announced that the first two sets of LM 66.6 blades have been successfully installed on Shanghai Electric Wind Power’s 4.0MW-136 wind turbine in China. Learn more about this milestone in our first deal with leading offshore wind turbine manufacturer, Shanghai Electric Wind Power. On September 18, we announced that the first two sets of LM 66.6 blades have been successfully installed on Shanghai Electric Wind Power’s 4.0MW-136 wind turbine in China. Shanghai Electric Wind Power’s 4MW platform is designated for Windclass II areas in Shanghai and beyond. We provided onsite support and service to carry out the installation of the LM 66.6 blades at the Shanghai Lingang Phase I site. 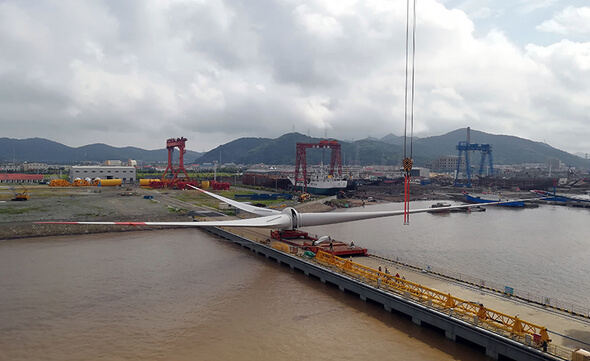 The installation of the 66.6-meter offshore blades on September 6, 2018 follows the signing of our first deal with the leading offshore wind turbine manufacturer, Shanghai Electric Wind Power. In the two-year agreement, our blade plant in Qinhuangdao will deliver the LM 66.6 blade sets during 2018 and 2019. LM Wind Power has been present in China since 2001 and currently employs nearly 2,500 people in the country. We operate three blade manufacturing facilities in Qinhuangdao, Jiangyin and Baodi. The 17 existing wind turbines of the Slufterdam wind farm have been replaced by 14 wind turbines that are much more efficient.